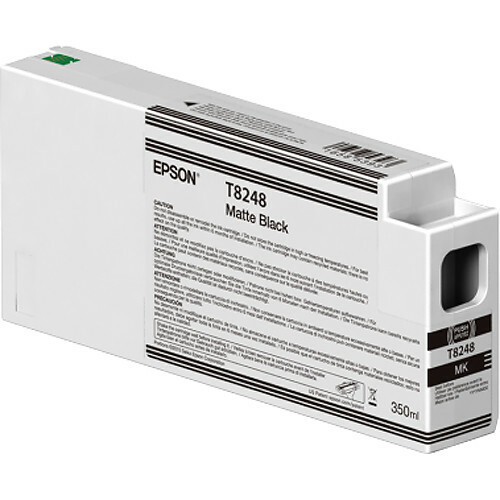 Make sure your printer doesn't run dry during an important job with this 350ml T824800 UltraChrome HD Matte Black Ink Cartridge from Epson. This pigment-based ink cartridge is available as a replacement or spare for the Epson SureColor P-series large-format printers. Box Dimensions (LxWxH) 12.55 x 5.85 x 2.3"
T824800 UltraChrome HD Matte Black Ink Cartridge (350ml) is rated 4.8 out of 5 by 13. Rated 5 out of 5 by Roy from Good Service The cartridge was an original manufactures item with a long expiration date and was delivered fast. I was almost out of ink and couldn't do a head cleaning because it was so low. I was able to complete my printing job almost immediately with the fast delivery. Rated 5 out of 5 by John S. from It's ink... Factory ink - as advertised and expected. It's good that it was packed very well as UPS sat something on it that nearly crushed a very stable box. Rated 4 out of 5 by Anonymous from Works as expected The cartridge is easy to install and produces a crisp, even color across large prints. Rated 5 out of 5 by John S. from Perfect Size Great ink and the perfect size based on per ml basis. Is it possible &amp; and factory-supported to mix SIZES of cartridge at the same time? (I know it's logical, but we're looking for a confirmed correct answer, not a merely reasonable answer. Thanks! Asked by: Prof. Colette B. Thanks for replies! Concerns resolved! Answered by: Prof. Colette B.